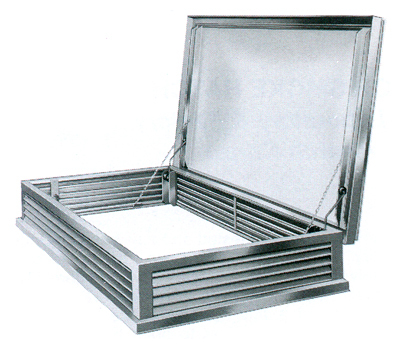 Furnish where indicated on plans, Smoke Hatch Dome Gravity Ventilator, factory fabricated, Dur-Red Products Model No. _______________, consisting of a one piece acrylic dome, either white or translucent or clear colorless; and a dome frame of extruded aluminum #6063-T5, with a minimum thickness of .070 provided with a self contained sloping condensation and weepage gutter for drainage. The retaining frame and curb frame shall be fabricated from steel or aluminum, and louvre blades shall be aluminum or G.I. steel; painted with two coats of acrylic paint. Lid hardware shall consist of safety stops; "heavy-duty" 3/16" aluminum pivot hinges, and chrome vanadium torsion springs and lifting arms.